Issue 14 might well be considered our biggest ‘indie issue’ of the year. We have featured interviews with the developers behind both Shovel Knight and Armillo as well as the team behind AiRace Speed. Be sure to check out our Holiday Buyer’s Guide for those last minute gift ideas. We summarize our favorite 3DS and Wii U games that should be on everyone’s list this Holiday season. 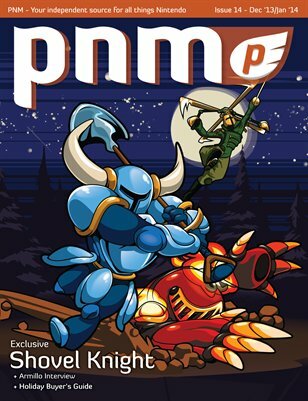 We also have a huge blow out on reviews this issue featuring all the hottest Wii U and 3DS games. Happy Holidays!